PUBLIC TRANSPORT EXPERIENCE: Livery Delivery : Confusion Profusion  Why not Sunflower Line? fbb is looking at his map extract. Theres 12, the Nettle Line; and 11, the Butterscotch Line; 13 the Winestain Line and that leaves X40 which has to be the Heliotrope Line; the world desperately needs a Heliotrope Line. And there's more map colours to come. What fun. FOCUS TRANSPORT: Formula One race technology to power buses in Oxford Fourteen new buses and six others will be fitted with the technology in a £3.7m investment by the firm. Operations director Phil Southall said the new buses would be the first "Gyrodrive hybrids" to go into service. PASSENGER TRANSPORT: Centro ponders jumbo artics for Sprint scheme Bus operators in the UK are currently limited to a maximum vehicle length of 18.75 metres, however in an OJEU notice seeking manufacturers to provide vehicles for Sprint, Centro says that it has ambitions to utilise single deck bi-articulated vehicles of 24-metres in length on Sprint corridors. “This is subject to derogation from the DfT which has yet to be granted,” it adds. How very under-whelming! Of course, the same valid charge of lack of promotional info can just as equally be levelled at the same operator's Taunton park & ride, so maybe it's not a surprise. It does seem a missed opportunity, though. I saw one of these yesterday evening in Keyham on the 4 service - so First have still not got over their difficulty in keeping route-branded buses where they belong. Quite an interesting Thursday for buses - starting in Truro with WG short on destination displays there, too. I went back into Plymouth via Liskeard and Torpoint - I hate driving along the A38 between Trerulefoot and Saltash - and shared the ferry with three buses. The 32A bus from Liskeard had missed the 6.30 ferry and had to wait for the 6.45 one - which it shared with another Citybus d/d going back into town ‘dead’ and an MPD of First in service on the 81. The Citybus I saw driving off the ferry - at low tide - grounded, which dislodged the back corner. Then, later, driving back just past St. Levan Gate, the pink-fronted bus already mentioned. WG have had a capacity problem on the 574 from Callington to Liakeard - again caused by the popularity of Callington School in that, although pupils from Pensilva get free transport (Down’s), those from Darite and St. Cleer can have free transport to Liskeard, but not to Callington. To their credit, WG have met this by using a Solo on that journey - which still had a standing load this afternoon. Also this afternoon I saw First’s 79 - rather to my surprise a fairly elderly double-decker. The destination display, though, read ‘School bus’, which is odd on a journey which is registered as a service open to the public which appears on Traveline, although not on First’s own web-site. It is hardly going to attract much business with ‘School bus’ on the front - and there didn’t seem much point at waiting at the New Road stop in Callington. When it did leave, with a reasonable load, the WG 574 was behind it completely empty. Very cheap and tacky so much for a 'revamp' of Plymouth services, seems to be going down hill, losing our newer buses to Cornwall of all places! This is very disappointing, why can't First try to work along side Go Ahead like Bluestar in Southampton! 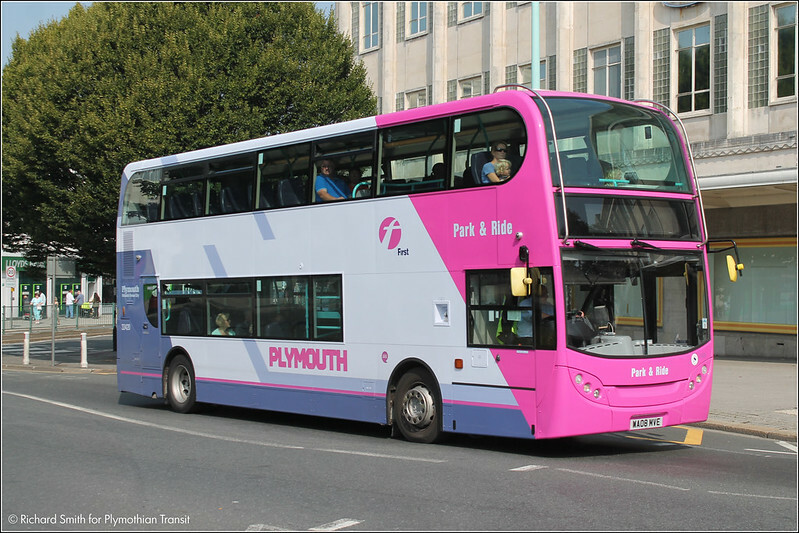 If anything im sure the people of Plymouth would rather have two bus operators with quality services, than one pushing the other out of town forcing older stock have to be brought in to reduce costs! 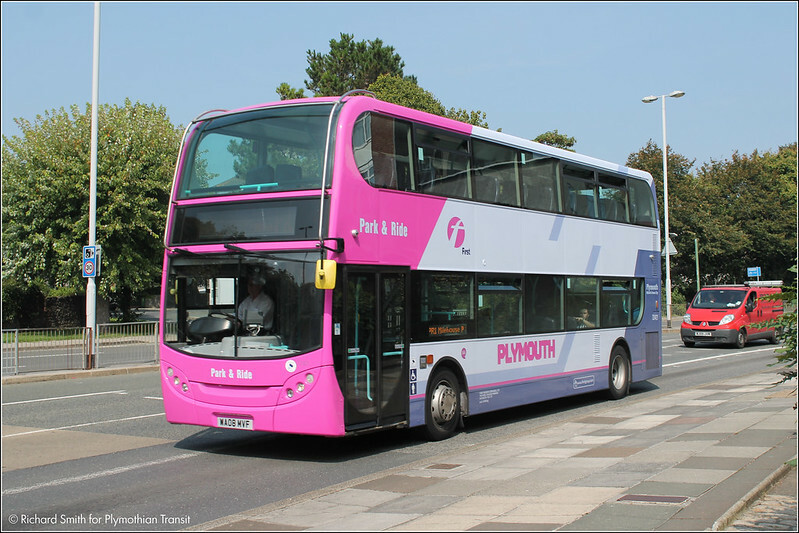 It does hide the fact that older buses have replaced the 12 plate Enviros now in Cornwall.Perhaps no route branding because they could alternate between both Park and Ride routes?. I actually think they look really fresh and smart! 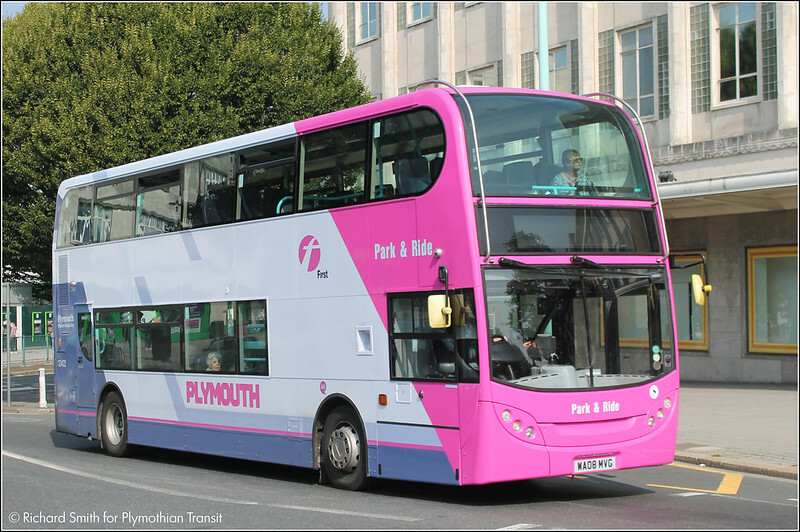 I'm pleased to see that First are now taking steps to smarten up their fleet and I think these look really good and eye catching riding round the streets of Plymouth.... And the point is that they are branded loud and proud 'Plymouth' Park & Ride! Still demonstrate's First's lack of enthusiasm for Plymouth quite adequately!!!!!! It's the inside of the bus that's more important. A vast improvement. Hopefully First may add adverts for the service between the decks, like the Torpoint tridents have. Even though the Plymouth P+R is commercial they should still make it more attractive for customers to use the service and therefore gain more money, its all swings and roundabouts, one/two services of the 4 where interlocked with the Park + Ride, it is all to do with which bus is best to maximise profitability, but sometimes they can't manage to do that, 30 minutes turn around on few services on the 15 at Woolwell, although popular with drivers, not for a business where making a profit is crucial for survival, especially in Plymouth, First do have the resources and the power, but chooses to use it in the midlands, hence the fact they have pulled out of London. "First do have the resources and the power, but chooses to use it in the midlands, hence the fact they have pulled out of London." What a load of tosh! Show me where in the "Midlands" First have used these "resources and power"!